2003 Ties for a Record Number of Unopposed Elections in Modern Times. Margins of Victory High as Democrats Gained in House, Republicans in Senate. Decrease in Women's Representation in General Assembly. Marginal Increase in African-American Representation. Republicans Outspend Democrats, Campaign Spending Declines. "In a state with an election every year, it is unreasonable to expect intense competition each November," said Sabato. "But Virginia's 2003 General Assembly contests tried the patience of any who believe in representative democracy." 12/5/03 | The 6th annual American Democracy Conference, the Youth Leadership Initiative's second annual e-Congress, and three new books in the American Political Challenges series are among the highlights from the Center for Politics' December email bulletin. 11/11/03 | The 6th annual American Democracy Conference will take place on Friday, December 12, 2003 at the New Hampshire Institute of Politics at St. Anselm College in Manchester, NH from 9:00 a.m. to 3:30 p.m. The University of Virginia Center for Politics hosts this year's conference in coordination with the New Hampshire Institute of Politics and The Hotline. The American Democracy Conference has traditionally brought together America's top political insiders - pollsters, journalists, party representatives, and a wide range of behind-the-scenes strategists - to discuss the most recent election and to look forward to the upcoming political season. Because 2003 is an off-year that features only three gubernatorial elections, the entire focus of this year's conference will be on the upcoming presidential nomination process, with particular attention to the pivotal role the New Hampshire primary plays in presidential politics. Logistics of the event will be handled by Joshua Scott at the Center for Politics (434-243-3540, jscott@virginia.edu) and Heather Newman at the New Hampshire Institute of Politics (603-222-4103, hnewman@anselm.edu). 10/30/03 | The Center for Politics at the University of Virginia released the Virginia results from its national research on Youth Civic and Political Engagement. The results suggest that Virginia high school students are not being adequately prepared and encouraged, either at home or at school, to participate in the American political and electoral process. The yearlong national study of high school civics students in grades nine through twelve took place during the 2002-2003 school year and has an overall margin of error of +/- 4.8%. "Clearly, voting is the hallmark of a self-governing society, but it remains a single act of political participation, the context and importance of which must be taught in order for it to be learned. Waiting until a student is old enough to vote before introducing them to other acts of political participation is waiting too long," said Ken Stroupe, Chief of Staff at the UVa Center for Politics. "The study suggests that parents play in important role in encouraging their children to participate in the electoral process. Furthermore, teachers who utilize experiential learning to introduce early formative political participation are more likely to succeed in generating sustained civic involvement than those who employ a more traditional textbook model for teaching civics and government." The study also found that despite the state's conservative tendencies, Virginia high school students are evenly divided on party affiliation between the Democratic and Republican parties with only slightly more identifying with the Republican Party (44%) versus the Democratic Party (40%) according to results from a national study by the University of Virginia Center for Politics of high school civics students in grades nine through twelve. Sixteen percent of students said they were Independent with no leanings toward either major political party. Funding for this research was provided by grants from the Center for Information & Research on Civic Learning and Engagement (CIRCLE) and the United States Congress. 10/02/03 | The University of Virginia Center for Politics, in conjunction with University Career Services will hosted D.C. political veteran Bill Endicott on Thursday, October 2 at 8:30 p.m. in Newcomb Hall's South Meeting Room. Mr. Endicott offered advice from his book, "An Insider's Guide to Political Jobs in Washington." Mr. Endicott was joined by a panel of political experts, many of whom are UVa graduates, to discuss their experiences in finding jobs in Washington, D.C. Mr. Endicott also participated in a book signing following his presentation. Bill Endicott has served in political jobs for three decades. He worked for three congressmen, the Democratic National Committee, and the Clinton Administration, first as a political appointee and then as the Director of Research and Analysis in the White House Office of Political Affairs. He is a graduate of Harvard College and Harvard's John F. Kennedy School of Government. The panel members spanned both major political parties and shared their experiences as job seekers in Washington D.C., with an emphasis on how to go about finding and landing a political job in a variety of offices, including the House, the Senate, the White House, various governmental agencies, non-profit organizations, and others. 9/22/03 | Howard Ernst, author of Chesapeake Bay Blues: Science, Politics, and the Struggle to Save the Bay, addressed University of Virginia students, faculty, staff, and members of local environmental groups on Monday, September 22. The discussion highlighted the political implications of the highly touted Chesapeake Bay restoration project. Ernst, assistant professor of political science at the United States Naval Academy and U.Va Center for Politics Senior Scholar, discussed the incredible challenges facing those who continue to fight for the restoration the Chesapeake Bay. Additionally, he explored why government policies have not been more effective. Former Maryland State Senator Bernie Fowler has suggested that Ernst's research should "motivate a wake-up call for all Bay lovers." To all concerned, Ernst offered hope that the necessary changes will be implemented to save the Bay. A book signing followed the discussion, which was open to the public. 6/10/03 | The University of Virginia Center for Politics will host the sixth annual conference of the Virginia Governors Project on Thursday, July 17 and Friday, July 18 at the Boar's Head Inn in Charlottesville, Virginia. 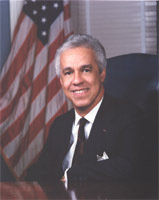 This year's program will chronicle the life and administration of L. Douglas Wilder, the 66th Governor of Virginia, and the only African American elected governor in the United States. The purpose of this annual project is to preserve the oral history of the individuals that have served as Governor of the Commonwealth, so that we may apply the hard-learned lessons of the past to Virginia's present and future. Expert panelists will discuss Wilder's pre-gubernatorial career and his rise to power; analyze the agonizingly close 1989 campaign for governor; dissect the gubernatorial administration; and reflect on the legacy left by Governor Wilder, not only on Virginia, but throughout the country. This annual program follows successful conferences exploring the lives and administrations of Governors Mills E. Godwin, A. Linwood Holton, John N. Dalton, Charles S. Robb, and Gerald L. Baliles. The Virginia Governors Project also features an hour-long documentary produced by the Center for Politics and the Community Idea Stations (WHTJ and WCVE), which will air the following spring. 4/15/03 | With a few hundred students and community members in attendance, the nation's leading writers and editorial cartoonists gathered in Newcomb Hall Theatre for a panel discussion on the politics of political humor. The panel included TIME's Matt Cooper, Jim Downey from Saturday Night Live, AOL cartoonist Bob Gorrell, The Daily Howler's Bob Somerby and Ann Telnaes, syndicated editorial cartoonist. The event, moderated by Center Director Larry J. Sabato, examined the intricacies of trying to make bold and humorous statements about serious current affairs, including the present situation in Iraq. The dialogue ranged from a discussion of the differences between mainstream media and political humorists in covering political events to the need for more women and minorities in the field of editorial cartooning. The panel discussion was covered by C-SPAN. 4/8/03 | In front of a capacity audience of 900 in Old Cabell Hall, the Center for Politics continued its 2003 National Symposium Series on Political Humor with an entertaining discussion involving Comedy Central's Lewis Black, political satirist Will Durst, and MSNBC's "Hardball" Producer Howard Mortman. Black and Durst together offered a lively and funny discussion of the role of political comedians in our society. The speakers focused their discussion on the current war in Iraq and the necessity for political humorists to discuss all viewpoints, and not use their audience to further a specific agenda. The speakers also reminisced about some of their favorite political jokes, including an extensive discussion about Dan Quayle. 3/28/03 | In conjunction with the University of Virginia Art Museum, the Center for Politics sponsored an exhibit celebrating the life and work of the famous editorial cartoonist Herbert Block. To complement the exhibit, the Center welcomed Library of Congress Curator Harry Katz, who shared with an interested audience important insight and knowledge of Herblock as an individual and as a cartoonist. Winner of several Pulitzer prizes for editorial cartooning, Herblock's cartoons spanned from the Hoover Administration to the current administration of George W. Bush. The exhibit will be open to the public at the UVA Art Museum until May 4, 2003. 3/18/03 | Before a capacity crowd of 900 in Old Cabell Hall, the Center for Politics kicked off the 2003 National Symposium Series on Political Humor with a discussion involving Center Director Larry J. Sabato and Comedy Central's Mo Rocca. Rocca, a political correspondent for Comedy Central's "The Daily Show" discussed the importance of political humor in a democratic society, especially in a time of war. Also, Rocca showed a number of popular clips from "The Daily Show," including a segment on the Emmy-award winning Indecision 2000 and his appearance on Fox's O'Reilly Factor. The event opened the two-month long conference dedicated to examining the role that political humor plays in America society. Center relaunches Sabato's "Crystal Ball"
1/27/03 | After a post-election hiatus, we officially re-launch Sabato's Crystal Ball as the political planets align. The New Hampshire primary is one year away, and the 2005 presidential inauguration is just less than 2 years away. The Crystal Ball has been given a complete overhaul, making our critically acclaimed site even more visually appealing and interactive.